I started this blog in April with the simple goal of documenting Matt's journey to pursue his dream of making the US Paralympic team. This past weekend was a huge milestone in that journey. Matt ran his first marathon in two years with the ambitious yet achievable goal of breaking three hours. His PR had been 3 hours and a few seconds and with a half marathon PR of 1:20 it is not crazy to think he could shave off a few seconds. Two weeks before the marathon Matt started to get Achilles pain. I knew it must have been bad because Matt took a week off of running and was walking around wearing an ice pack any chance he could. He even was stretching. Getting Matt to stretch is like having a clean house--a rare occurrence. Then, Matt found out that the race was certified by the International Paralympic Committee and running a sub 3 hour race could allow him to run in the London Marathon in April, a Rio trial. So let's just say Matt was feeling a bit of pressure. The week before the race he had some short runs and began to regain his confidence. It is amazing how one off week with pain can tank, at least mentally, six months of hard training. Last Friday he left for Sacramento with renewed enthusiasm. The weekend had a full itinerary of dinners, lectures, and events. Matt called frequently telling me about his experiences. His excitement was apparent. He had two awesome guides with him, one for each half. He has come to rely on his guides, which is no small feat after 30+years running without guides. 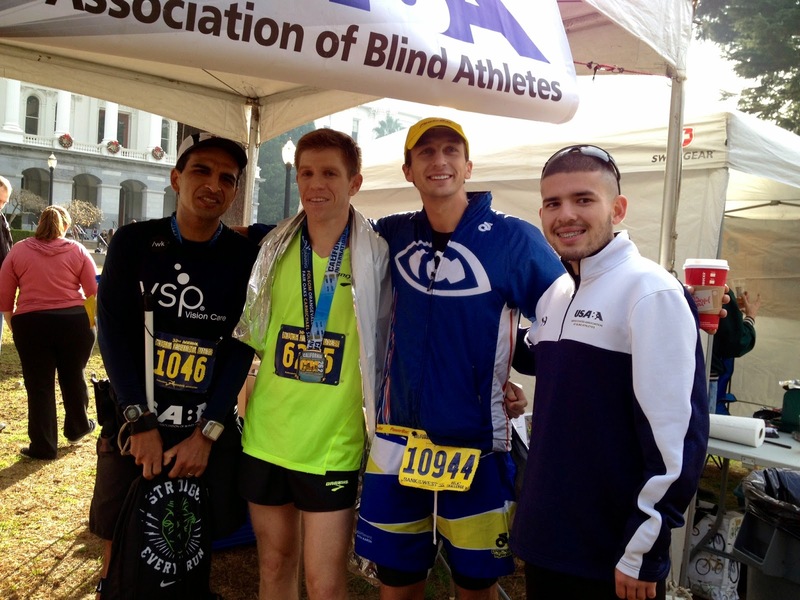 This year during the marathon, a group of young visually impaired paralympic hopefuls participated in the USABA Paralympic Experience. This event was not short on inspiration. Matt probably wouldn't have known about the California International Marathon if it wasn't for Richard Hunter, the force behind making it the USABA Marathon Championship, increasing the field of very talented visually impaired runners, securing funds to help offset travel costs for these athletes, and partnering with local universities to provide guides and overall support to the runners. I remember getting a call out of the blue after Matt's first Boston and it was Richard. He asked for Matthew so I thought it was a telemarketer, but he then went on to say he was a fellow visually impaired runner and I quickly handed over the phone to Matt. 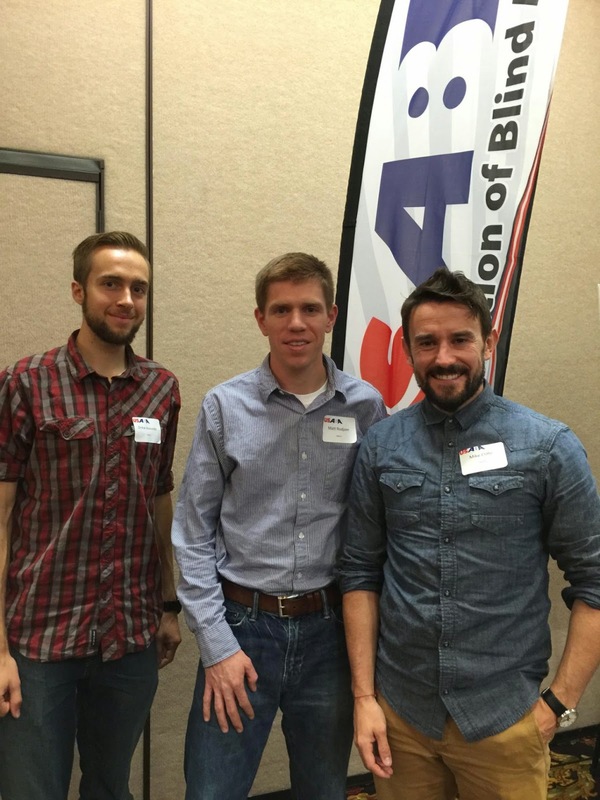 He called to introduce himself and recruit Matt to consider coming out to California to run. The next year, Matt did just that and won the USABA championship. Richard's mother-in-law, Inge, graciously opened her home twice to Matt for the 2012 and 2014 race weekend. Not only has Matt raved about her (and her cooking), but it also made it possible for us to afford Matt going to the race. You probably are ready for me to just give you the results already. Okay, okay. 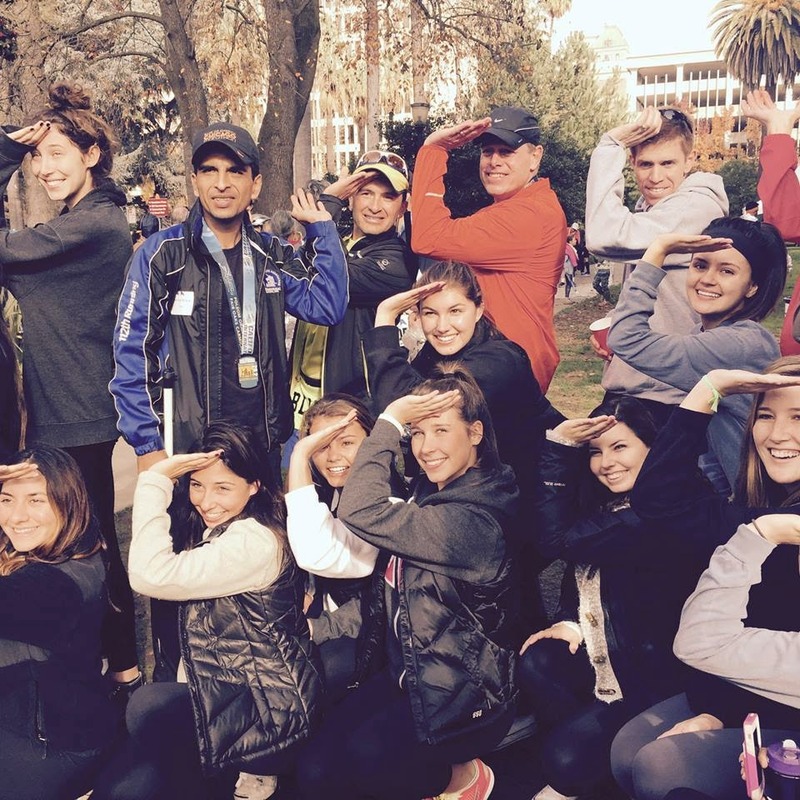 I spoke to Matt the night before the marathon and his plan was to run 6:40 miles. He felt great at the start. In fact, the bus was able to take the visually impaired runners directly to the start and saving them a walk up a big hill. He went through the 10k in 6:39s and the 20 mile mark he was holding a 6:47 pace, still on track for a sub-3:00 marathon. At mile 24 Matt's right hamstring completely locked up on him to the point of having to walk it out. Paramedics were running after him to see if he needed help, but he told them no. If they had even touched him he would have been forced to leave the race course...at mile 24. Matt was able to get back up to a run, but he was in pain. In the end, he finished in an overall time of 3:04:21, a very respectful time AND a Boston qualifying time. Unfortunately, it was four minutes over the London A standard. It secured him the 3rd place overall Visually Impaired runner place (and second B2 finisher). I was heartbroken for Matt. If I were him, I probably would have cried. But when I spoke to him shortly after, expecting to hear disappointment in his voice, I heard excitement and the words, "I gave it everything I had." He then went on to tell me that he knew Adrian was ahead of him (we later learned that Jason Romero was also ahead of him) and then started talking about his great guides (Mike and Drew), the race overall, and how he needed food. I called this post "Greatness" because that is the word that came to mind after I got off the phone with Matt on Sunday. Greatness as an athlete in giving it everything he could. Greatness as a competitor in being supportive and thrilled for his fellow VI runners. Greatness as a dad in showing our children, whether or not they understand it now, how important it is to accept defeat and not see it as weakness. Greatness in life in not dwelling on his time, but instead going on to enjoy the rest of his activities that day. Greatness as a group of VI runners together supporting each other doing what they love. Matt's not sure what is next. It's only be a few days and he's still has the post-marathon shuffle. It could be Boston in April, or it could be focusing on track events instead. We knew the road to Rio would be long, but he's still on his way. For right now, the focus is on family and Christmas. I'm sure the running shoes will be dusted off soon. Before I close I want to tell you a feel good moment I had over the weekend. I write this blog and have no idea who reads it. I see the number tally, but that's about it. Matt said that not only did several people tell him over the course of the weekend that they read it regularly, but also that the post I wrote about Matt placing at Boston (and getting his picture with Kara Goucher) was the subject of discussion and that THAT post got forwarded to the Boston Marathon's Disability Director. 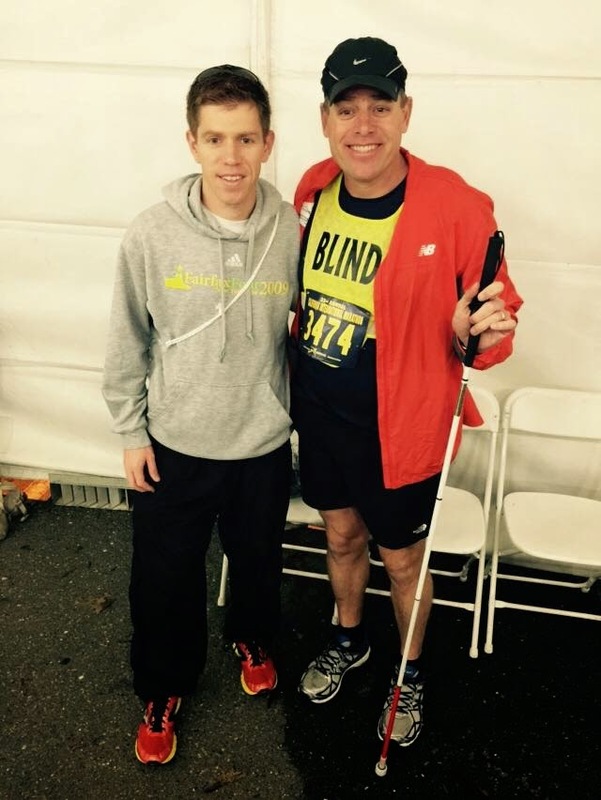 (Here's a link: Running Celebrities post) This year the Boston Marathon did not include the Visually Impaired runners (and some of the other disability categories) in the awards ceremony. I don't know if my post will change any one's mind, but I hope it at least planted a seed that every winner, regardless of time, deserves that feeling of being recognized for their amazing achievement along with all of the other winners. It is important for the overall winners to see and cheer on the other categories, too, because as hard as the race might have been for the overall winner, it was just as hard if not harder to have done it without sight, missing limbs, or in one of the many other categories of runners. The Visually Impaired winners aren't even listed on the 2014 winners results page. If Matt does run the 2015 Boston Marathon, I hope he'll be able to go to the awards ceremony, either as an award recipient or to cheer on the VI runner that is the award recipient. I'm not sure who might be reading this today, but I hope you agree! Here are some pictures to help document the weekend. I'd like to say a big thank you to Mike an Drew, Matt's two guides for taking care of him on the race course, and Richard Hunter and his family for making this event what it is!